How to make a fake bag, at Kottke. The CEO of Saddleback Leather giving a crash course in leatherwork and how you can make a cheap ripoff of one of his bags. Fall DIY Project: How to Re-Wax Your Clothing and Gear | Man Made DIY. Cool Tools – Waterpik Water Flosser. It’s not really for flossing, it’s designed to work on “the bacterial biofilm that perpetually forms on the surface of teeth and that never quite gets cleaned away by toothbrushes, dental floss, and various gum-recess cleaning gizmos.” Good to know. craigslistmirrors. Endlessly fascinating. For real. Via Waxy. The Radiating Beauty of Wheel Icicles, at Visual News. This is crazy. Via Girls of a Certain Age. From Hummingbird Heads to Poison Rings: Indulging Our Antique Jewelry Obsession | Collectors Weekly. An interview with Monica McLaughlin who writes the fascinating column on estate jewelry over at The Hairpin. One of the things shown are coach covers, hollow hinged spheres women used to cover the diamond in a drop earring to hide it from view during the day, so clever. Also, taxidermy jewelry! Via Girls of a Certain Age. The Story Behind The Gilmore Girls Music tol by Sam Phillips. At Refinery 29. Amy Sherman-Palladino is a former professional dancer? That makes Bunheads a bit clearer. Side sleepers: give your pillow reviews. | Ask MetaFilter. Recommendations for firm pillows that aren’t necessarily the too-warm memory foam sort. Cool Tools – Trauma Shears. Strong enough to cut through a penny, these look great for crafters to have around. I want the absolute best, most bombproof compact umbrella available. | Ask MetaFilter. This is a timely question for me, we managed to misplace all of our umbrellas this year. The Best Pen | The Wirecutter. My favorite pen was given out as a freebie at a conference I attended earlier this year and I have no idea what sort it was other than it was branded Bic. None of the Wirecutter favorites are the one I love so my search goes on. This Wirecutter post shows that there are a surprising number websites dedicated to reviews of pens. Haute High Tech: 20 Must-Have Pieces of 3D Printed Jewelry | Brit + Co..
By Jon Ronson, obviously. I’m a fan of Ronson’s from hearing his stories on NPR but this is the first book of his that I’ve read, the sample chapter on Juggalos pulled me right in. By Mary Roach. This is a nonfiction book about the human digestive tract, it’s entertaining and so fascinating. By Allie Brosh. I read this one on my iPad because it’s full of her signature illustrations. Her stories about childhood and depression and things in general are hilarious and touching. By Seanan McGuire writing as Mira Grant. It’s about a future where engineered parasites are used to keep us thin an healthy, what could possibly go wrong? I’m a fan of Seanan McGuire’s Feed trilogy (Feed, Deadline and Blackout) which is about bloggers and zombies and government conspiracy and I really love the novellas she’s released that are set in the same world (see: San Diego 2014: The Last Stand of the California Browncoats and Apocalypse Scenario #683 among more). I’m also really enjoying her Indexing serial about fairy tales invading the modern world and her book about what superheros might really be like, Velveteen vs. The Junior Super-Patriots. Can you tell I’m a fan? I’m a fan. This was written by Lauren Graham, yes Loreli Gilmore, and it has the sparkling, funny, bumbling character that you would hope for. It’s about a struggling actress living in New York in the 90s when a show called Friends was just starting to air. Utterly enjoyed it. By Robert Galbraith aka J.K. Rowling. I liked the first part so much I saved it for travel reading. By Andrea Phillips. This is a year-long monthly serial and each new addition contains a puzzle, the answer to which unlocks a page on the Lucy Smokeheart site. At the end of series there will be a real treasure hunt (!!!). I saved these for some serious puzzle solving time on trains while on our trip. Each part is available to download and she’s also collected parts 1-3 and parts 4-6. Here are links to each she’s published so far (and she’s not done yet! ): Book of Secrets, The Mermaid’s Crown, Port St. Never, Lizards of Skull Island, Ice Storm, The Governor’s Ball. These are all short and very fun. By Hugh Howey. This is a series of books about an apocalyptic society living inside a bunker for generations and the first set, Wool, kept me really engaged but I don’t find myself quite wanting to revisit the story in the follow up books called Shift and Dust. Still, I didn’t know how the original story ended and it was one of those times when I was glad to be free of spoilers, it was fun. Has anybody read Shift and Dust? Should I keep going? By Peter Stenson. I feel like I’ve read my way through all the zombie novels and am quick to abandon any that don’t keep me. This one I read and enjoyed. It mixes drug addiction and zombies and, well, the end isn’t the happy sort. By Maria Semple. I don’t know if I’d have liked this book as much if it wasn’t set in Seattle and I didn’t recognize some of the character types. That said, it started in Seattle and ended up very far away and I liked the journey. By Eoin Colfer. I was a huge fan of Douglas Adams (I listened to the original Hitchhiker’s radio series on road trips over and over again) and I’m also a fan of Eoin Colfer but for some reason I cannot bring myself to read past the first few pages of this book that is an extension of the Hitchhiker’s Guide to the Galaxy series. I feel like I am cheating on my celebrity crush with an imposter, even though I know that Adams’ widow chose Colfer to write this. Give me encouragement? Did you read it and love it? What am I so afraid of? Your turn – what are you reading? What have you really enjoyed lately? Tell me because I’ve completely run out and my eyes need more words to consume! Years ago I received a Scanpan 8-inch frying pan as part of some conference* schwag**. Sometime after that our regular small nonstick frying pan finally went to the cookware grave and we pulled out the Scanpan. We were pretty darn impressed with it’s nonstickablility and how easy it made it to cook an over-easy egg just right every time so we continued to use it. For four years. I’m just now taking note of how awesome it is. 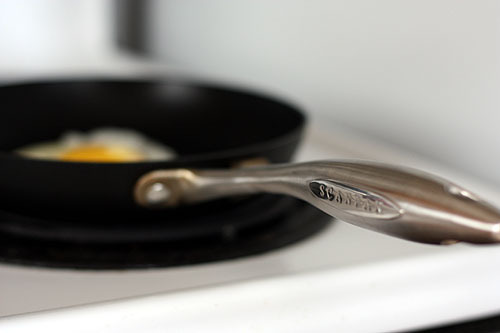 The pan is easy to use, it’s easy to clean, nothing ever sticks, it holds up to my clumsy handling and stacking beneath dirty dishes and, despite four years of near daily egg cooking, you have to look really close to see any scratches. Thumbs up. I have to say though, when I went to find our pan over at Amazon I was a little aghast at the price ($120, on sale for $90). And then I thought a little bit about the psychology of how we value things, or fail to value them if they’ve been handed to us. And then I thought about all the nonstick pans we’ve owned that came before it, inexpensive numbers that scratched easily and flaked horrifyingly after only a few years. Each of those was $10 to $20 and, had we been more responsible, we’d have replaced after a year of use. (And then I thought about the Great Toxic Teflon Freakout of 2008ish and did a bunch of reading which made me conclude that I am not qualified to defend nonstick but I am confident that I’m not poisoning myself.) Added up the Scanpan has nearly already been worth the price tag and I anticipate it going strong for another four years. So if you know you’re going to use it well and you have the cash, Scanpan is worth it. * It was a hefty bag of free items that has since become the stuff of legend. I am pretty sure it was the first International Food Bloggers Conference, but not absolutely certain. I do know that I paid to attend said conference so this wasn’t a case of a blogger getting free stuff just because. ** Let’s discuss swag vs. schwag. I have a personal preference to use the word schwag because one of my theater professors in college was known to have occasional emotional outbursts over off-topic irrational things while teaching class and one of those that I had the privilege of being present for was a rant over the use of the word swag. He said: swag is used to describe the way that one drapes a curtain, schwag is the free stuff you get at a conference. The end. And so, because I believe he can still see into my very thoughts, I use the word schwag. Er Wang Dong cave in China so huge it has its own weather system | Mail Online. I love caves, it’s been far too long since I’ve been in one. Three Panel Soul » On Discovery. Yup, that’d be me too. What things cannot be made by machine? | Ask MetaFilter. “For example knitting can be duplicated by machine, but crocheted items can only be made by hand.” As a knitter who has avoided learning crochet because it seems to involve too much counting and too much paying attention at all times, this comparison is riveting. Will we eventually foil the robot takeover by communicating via crochet and macrame? Family Outfitted in Awesome ‘Labyrinth’ Costume Ensemble. Via Laughing Squid. This is amazing all around. Podcast Thing, short interviews with interesting people offering up their favorite podcasts. Via Swissmiss. Dopp Kit Essentials. “Dopp kits gained their namesake from a German immigrant leatherworker named Charles Doppelt.” Tell me more. Art of the Shim. Shims are serious, low-alcohol cocktails that are fun and delicious but won’t knock you out with booze. My friend Dinah just happens to be the author of this book and I know for certain that she has great taste in cocktails. Damn, Gina, dramaticstart: Vacation rentals for viewing The Northern Lights. What?! I am doing this. Testing 30 Life Hacks We Found on the Internet | Mental Floss. (Video.) I adore how delighted he is when something actually works. How Has “Bust” Magazine Survived? – The Awl. I’m glad it has. I have an iPad mini which I bought last year and here are the accessories that I couldn’t do without. The Joy Factory SmartSuit iPad mini case. I bought this based on the recommendation from the Wirecutter. I snapped it on and have used it ever since. It’s held up perfectly well. The case is a hard shell with a grippy surface which helps me and my clumsy fingers from dropping it. It has a screen cover that is lined with a faux suede material that won’t scratch the screen. The screen cover folds back to sit flush against the back of the case when you’re using the iPad and it doesn’t get in the way of your fingers. Or the cover bends into a triangle that acts as a stand for the iPad in horizontal view. The cover doesn’t get in the way of any ports or switches, it does add a little bit of bulk to the iPad, not much but enough to make me feel a little more secure when holding it (I find the iPad mini startlingly thin and I’m always afraid of it slipping out of my hands). The case doesn’t have any extraneous bits or latches that get in the way of holding or using the iPad. The case is so secure that I will happily slip my iPad mini into my bag without worrying that it will be scratched. Mophie Powerstation External Battery Charger. This external battery has saved my sanity many times while traveling, let alone while sitting on my couch too lazy to go find an extension cord so I can continue to use my device while charging it. I keep it in my bag and use it far more often than I’d anticipated. I gave Mophie batteries as gifts this past Christmas, including this smaller model that comes on a keychain to somebody who takes long bike rides. I use it for my iPhone and my iPad and I feel a little itchy when I forget to bring it along. It recharges via mini USB and can do nearly two full charges on my iPhone. I love it so much I should probably go ahead and give it a name. Your turn! Do you have any iPad gadgets that are particularly useful? Cheesy Mashed White Beans With Kale, Parmesan, and a Fried Egg | Serious Eats. High-Proof Talent – Winter Survival Guide – The Stranger. This tour of Seattle distilleries has me thinking of gathering some friends and seeing if we can pitch in for some dedicated transporation. Bubble and Sweet: Pinata Smash Cake DIY tutorial. Ladies and Gentlemen, we have a winner. The Food Lab: The Science of the Best Chocolate Chip Cookies | Serious Eats. J. Kenji López-Alt on all the little things that make up the perfect chocolate chip cookie. Ask a Cicerone: What’s the Best Way to Learn About Beer? | Serious Eats: Drinks. Are Din Tai Fung’s Soup Dumplings Worth the Wait? | Serious Eats. They opened their second location here in Seattle and predictably the wait time is immense.